Every morning I put on : moisturizer, foundation and powder. I always feel that it's too heavy on my face and I want to stop wearing one of these three. Moisturizer is important for the skin so I had to keep that one. Foundation makes my skin flawless and I like that. Powder sets my foundation, giving it a matte finish. So I thought the best alternative was : BB Creams. I've been thinking about using BB Creams for months but never found the right one. I heard and read about them on blogs and YouTube but some of these creams were really expensive or didn't even exist in Belgium so I had to order them online without trying them out, which I didn't like. 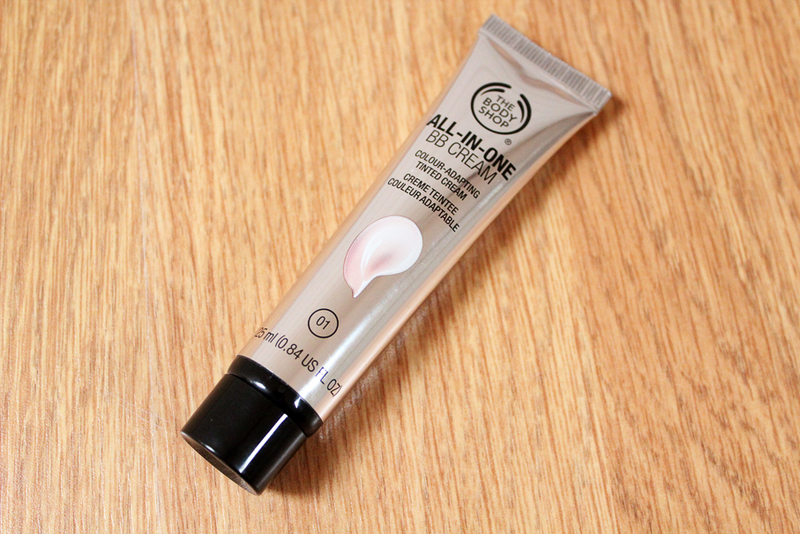 I went into The Body Shop the other day and tried their sample of the All-In-One BB Cream. I was happy with the colour and texture so I bought it. POSITIVE : I'm really pleased with the result. I used it last night and got compliments from my friends. It's really light and gives a good coverage, I felt like I wasn't wearing any make-up. I did use some powder on top, but only to give it a matte finish. It's not expensive, only 13€, so if you're on a tight budget and/or you just want to try new products, I highly recommend this BB Cream. NEGATIVE : It made my skin very dry, so if you already have dry skin, maybe you should use your everyday moisturizer before. I applied the cream on my face and in seconds I could feel it was dry. It doesn't really bother me but if I have to say something negative about this cream, it would be that. I've always wanted to try the Ultimate BB Cream by Iroisie but I'm really happy with the All-In-One from The Body Shop.